Off-topic for this post, but I’d like to officially congratulate Chris Samnee for winning the Best Penciller/Inker Award at the Eisners last week! He and David Aja shared the award and I couldn’t be happier for both of them! This is such a well-deserved win for Samnee, and I hope it has the added bonus of maybe getting some of the people who are still resisting Daredevil to give it a chance! If you haven’t checked those out yet, I also recommend CBR’s coverage of the Mark Waid-moderated Spotlight on Chris Samnee panel at SDCC, and the preview to Daredevil #29! Okay, now to the topic at hand: Regular commenters Bee Clayton and Daniel have both asked me what my take is on Ikari having both sight and a radar sense. Is it even possible to have both? If so, would that be like double-vision? What gives? First of all, I’ve gotta tell you guys that whenever you want to ask me a question in the “Daredevil science” vein, go right ahead! Not only do I love tackling them, but it’s always interesting to get a sense of what has you guys scratching your heads. It might very well be something I missed completely. When it comes to the question of whether you can combine sight with a radar sense, I assume we’re all in agreement that this is a highly theoretical scenario. I’ll offer my two cents (and present my “case”), but there isn’t going to be a testable hypothesis here. When we first learned that Ikari was sighted, back in Daredevil #25, it didn’t seem at all implausible to me that his sight might be intact in parallel with his radar. I mean, a great many things in superhero comics – including a relatively down to Earth title like Daredevil – don’t make perfect sense. This just didn’t register as anything out of the “comic book ordinary” to me in the way other things sometimes do. Regardless of what the radar sense really is, for this discussion it makes practical sense to regard it as a separate entity. 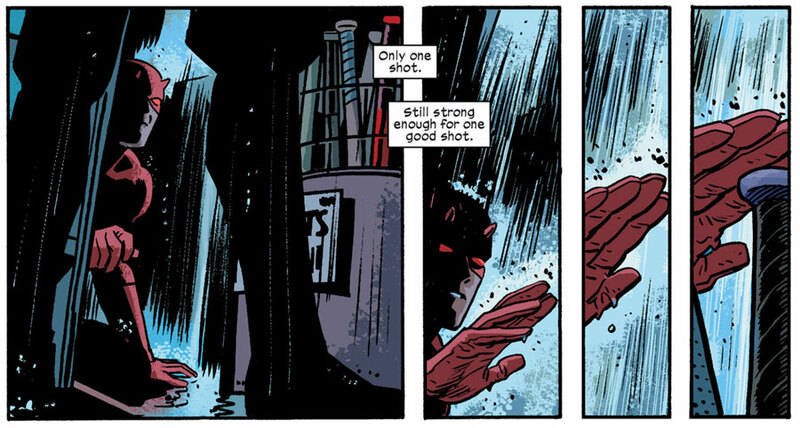 Even if we hypothesize that the radar is really an advanced form of echolocation (my personal preference), Daredevil’s brain would be expected to handle the echoic input differently than sounds which don’t carry the same kind of spatial information. There is actually real world evidence to support this notion, in the form of a 2011 study comparing the brain activity of two expert blind echolocators (one of them none other than Daniel Kish) to that of two sighted controls. What the researchers discovered was that while all subjects showed the same pattern of activation in the auditory cortex of the brain, the sound samples which had an echo sound component mixed in, also activated an additional part of the brain in the echolocators. This additional activation was concentrated to the so-called calcarine sulcus which also happens to be the location of the primary visual cortex. While echolocation is not vision in any traditional sense, the brains of these echolocators are clearly treating echoes as “vision-like” in important ways. It seems pretty clear to me that if Matt Murdock were a real person, his visual cortex would similarly be involved in processing his radar sense whether the sense is based on sound or some other signal that his brain can detect. If you’re following along so far, you might be asking one very relevant question: What if the visual cortex is occupied with actual seeing, as it would be in a sighted person such as Ikari? That is a good question, but I’m not sure this complication is necessarily all that problematic. Let’s go back to the real world example of echolocation since it provides the closest thing we have to a real-life model of the radar sense. While no known sighted “echolocation experts” exist that exhibit the same level of skill as the blind subjects in the study mentioned, there is no evidence to suggest that this would be impossible. Several studies have shown that basic echolocation skills are something most people, sighted or not, can master with surprisingly little effort. However, putting in the countless hours of daily practice that Kish and others have done hardly seems worthwhile if you actually can see. If a sighted person were to put in the work though, would he or she eventually show the same pattern of brain activation as blind echolocation experts? Possibly. There are several brain areas which handle input from more than one sense, and it seems that in many respects the brain “cares” more about what kind of information can be extracted than through which sensory channel the information was delivered. In this specific case, there’s simply no data. Going back to the comic, Ikari could have reached the same level of skill as Daredevil, but his brain might handle the task differently. Having said that, I don’t think that Ikari would necessarily experience his radar sense the same way Daredevil does. For Ikari, the radar sense would obviously be most useful outside of his field of vision, or in pitch black environments. Straight ahead, in a sufficiently lit environments, sight obviously beats radar (which was frustratingly clear to Daredevil toward the end of his fight with Ikari). But what purpose might the radar serve in the portion of the visual field where input from both senses overlap? My hunch is Ikari might experience a kind of enhanced vision that would give him better depth perception. This is speculative, of course, but there is one intriguing real-life experiment that I think backs this up. In great contrast, the other two subjects reported profound changes in their subjective experiences. Yet they did not perceive a local magnetic ﬁeld. Instead, these subjects described that the input from the belt reﬂected properties of the environment rather than being simply tactile stimulation: ‘It was different from mere tactile stimulation because the belt mediated a spatial feeling.’ This feeling was present in everyday situations: ‘I was intuitively aware of the direction of my home or of my ofﬁce. For example, I would wait in line in the cafeteria and spontaneously think: I’m living over there.’ These subjects also showed improved orientation performance and higher awareness of the spatial relations between different locations while wearing the belt. They had a feeling of an ordered environment, which was guided by the subjective experience of the space in which ‘reference points are intuitively present and help a lot in navigating around and understanding relations between places’. Unexpectedly, magnetic north had no special status, but spatial perception related always to landmarks. The actual spatial context was felt as being massively enlarged, and spatial relationships could be memorized effortlessly. Both subjects report effects on memory of places, landmarks and orientation. What these two subjects seemed to experience was an enhancement of their sense of space. Had they been equipped with something resembling Daredevil’s radar sense instead, the effects would obviously be quite different, but I would argue that the “layering effect” of Ikari’s sight and radar would not lead to double-vision so much as enhance the combined experience of the two. Very interesting post. I once watched a documentary which featured Daniel Kish. The documentary (Extraordinary People – The boy who sees without eyes) was actually about another echolocator called Ben Underwood, whose skills I think actually surpassed Kish’s. Sadly i’ve since learned that Ben died. You can watch the documentary, in parts, on Youtube. It’s amazing stuff. As for Ikari… I just assumed that he would close his eyes (!) and the lack of visual stimulus would automatically activate his radar sense. Wow, thanks for addressing this topic! Now that is what I call fan service haha. As usual a very well thought out and researched post. I especially liked the Novel Sense research, very interesting. Where did you come across it? I suppose Ikari would still see but also be able to “feel” his surroundings in the same way DD does. But a very interesting theory about how Ikari would perceive the world where both his sight and radar overlap. I think you might be right about seeing but also having an enhanced sense of spatial awareness. I never thought about it like that but it does seem to make sense. The brain does have a very high ability to store and process information so I can see how it would be able to handle both sight and radar. Although I do think Ikari’s brain adapted to this new sensory input very quickly. Didn’t it take Matt a while to adjust? But hey it is a comic book so I try not to think about it to much. But anyway thanks for the post, it was very cool to read.